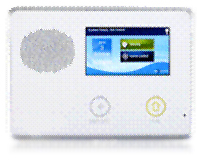 Access control keypads for single, or multi-partition or area systems that can be programmed to protect other areas. Contact us to learn more about these products. As a substitute for landline alarm communicators or for use as a back-up to existing systems, Uplink remains on the job with a secure, reliable connection that transmits alarm events instantly, in the event of phone service disruption or if your customer has wireless-only service. Uplink has been providing wireless alarm communications longer than anyone else, having deployed our first solution in 1996.